Representative Sonya Anderson, a Republican from Greene County, was given the honor of Temporary Speaker of the House, a largely ceremonial position moments before the Speaker is elected for the year. The Speaker of the House for 2019 is Elijah Haahr, also of Greene County. House Minority Leader Crystal Quade is from Springfield as well. 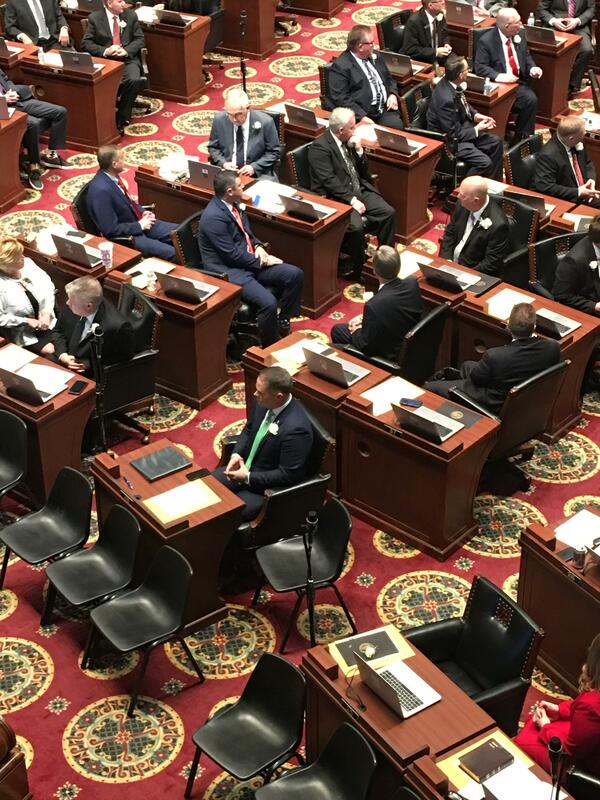 Missouri’s legislative branch is officially back to work. 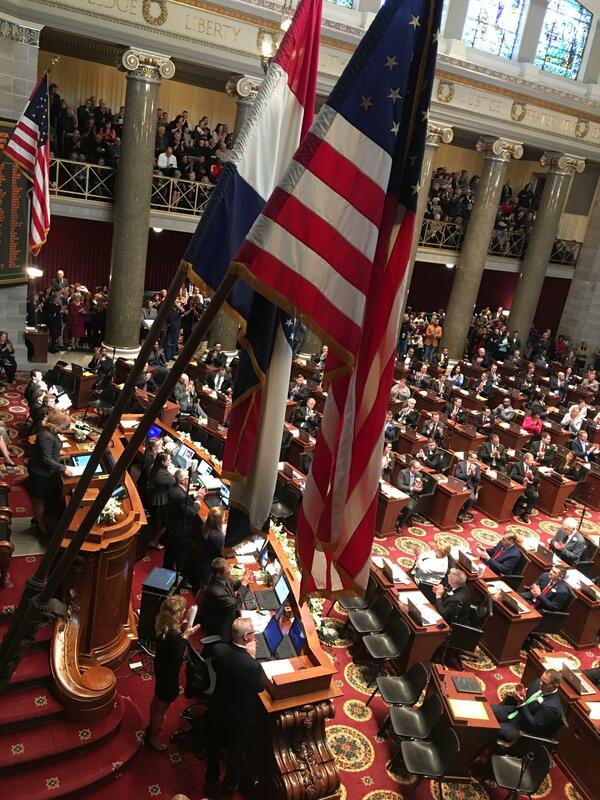 State lawmakers were sworn in for the 2019 legislative session Wednesday—and the opening session featured several individuals from Greene County in positions of leadership. The new speaker pointed out that many leaders in this year’s General Assembly are relatively young, and he teared up when talked about being the home-schooled son, raised by a stay-at-home mother and a father who worked in construction. Before Haahr was elected, another Greene County lawmaker, Sonya Anderson, R-131, was given the honor of becoming Temporary Speaker of the House, a mostly ceremonial position that conducts the order of the House for a few moments of the General Assembly's first day. Elijah Haahr, center, is the 2019 Speaker of the House in Missouri. of the House, even though it is unlikely that the minority leader will pursue the nomination; this year, Democrat Crystal Quade of Springfield was nominated by one of her Democratic colleagues to be Speaker of the House, but in her remarks, she declined the nomination, calling Haahr her "friend." Quade is the Minority Leader in the House of Representatives this legislative session. Missouri’s legislative session runs from January through May of each year. Missouri residents can identify who their representatives and senators are by going to the Missouri House and Missouri Senate websites: www.House.mo.gov and www.Senate.mo.gov. In the Senate chamber, Greene County saw two new state senators sworn in: Republican Lincoln Hough and Republican Eric Burlison. Ethics 101: What Defines a Lobbyist in Misssouri? As it stands, Missouri law permits lawmakers to accept gifts like trips, meals and tickets to ball games from lobbyists. And there’s no limit on how much a lobbyist can spend on an elected official. Governor Eric Greitens has said he’d like to ban lobbyist gifts, but with only a month left in this year’s legislative session, that’s unlikely to happen this year. While that debate continues, we thought it would be helpful to offer a refresher on Missouri law regarding what defines a lobbyist. It’s rare that a Missouri governor gets their first opportunity to achieve some of their agenda in the third year of a four-year term. But that’s exactly where Gov. Mike Parson is going into the 2019 legislative session. The Republican chief executive came into office last June after the scandal that knocked Eric Greitens from the governorship. With commanding GOP majorities returning to the Missouri House and Senate, Parson will get the chance to reshape state government that Greitens squandered.